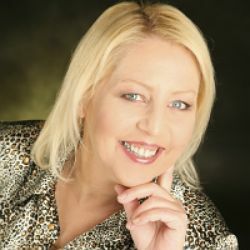 To improve your peace of mind, I give you a list of 31 mini tasks to get your life uncluttered. Take these on board for a month, to help get things back on track in a few areas of your life. You know what it feels like when you have allowed a few jobs to be left undone, for a bit longer than you really would like. I think you also know what it feels like to carry around the weight of those through your days, even weeks. Then, you must also certainly know the feeling of lightness and freedom once those kinds of jobs are done and out of the way! Begin to recognize how important it can be for emotional well-being, to stay on top of things and to have little “systems’ in place to keep things “ticking over” nicely? 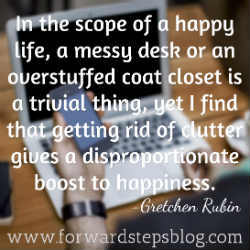 A lot has been written about reducing clutter in our lives and its benefits towards feeling a sense of calm, freedom and not living in a constant state of overwhelm. Naturally, no list is of any use unless it sees some action, so hop to it, and remember to do only one per day! 1. Have all your important documents safely stored and well filed. 2. Get your regular payments scheduled into your calendar and where possible, all direct debited. 3. Automatically set email messages to move from your inbox into specifically named folders. 4. Check all your electrical leads, equipment and appliances for cleaning, storage or maintenance. 5. Go through your medicine cabinet and check expiry dates plus top up low volume items. 6. Check all your door and window locks for function, effectiveness and maintenance. 7. If you have a car, book its next service plus check oil, water, battery, filters and air in tyres. 8. Select your favorite tools for regular jobs and discard excess. You do not need 6 PDF writers! 9. Fix any leaky taps and clean all drains, sinks, baths, toilets. 10. Clean out and organize the contents of your wallets and bags. 11. Empty out all drawers in your home, then clean and organize. 12. Choose your messiest cupboard, empty it and re-organize its contents. 13. Clean your griller, oven and stove top. 14. How are your computers and files looking? Choose and do a 60-minute, focused job to organize those. 15. Consolidate any loans into one, cut up your credit cards or, take any other step towards being debt free. 16. Write your own “Bucket List” and take an action on one item. 17. Declare a “Do Nothing Day” each month and really, do nothing that day! 18. Set aside 30-minutes to call someone you’ve been meaning to call. 19. Eliminate one of your unrealistic expectations for this month or year. 20. Give away or discard clothes that don’t fit or you haven’t worn for a year. 21. Enter all your friend’s and family’s birthdays into your calendar. 22. Get business cards or personal cards printed for yourself. Handy when meeting new people. 23. Get rid of or give away 3 things that you don’t love having around or never use. 24. Write down anything that needs fixing and schedule a day for only fixing things! 25. Go through every piece of paper on your desk and deal with it. 26. Group and store all like or similar items together, so they’re easy to find when needed. 27. Buy a collection of greeting cards and small gifts to have handy for surprise events. 28. Have you looked under your bed, behind sofas and on top of cupboards lately? Do a tidy up. 29. If you died, could your family find all information they’d need? Get that arranged. 30. Ask yourself often: Is there a more efficient, effective or automatic way than doing it this way? 31. In those spare moments, if you have a job that takes less than 2-minutes, do it now! I’ve actually got a list of 365 of these, however these will be plenty to get you started for one month. At the end of the month you’ll certainly feel quite organized and you might even feel motivated to write up a similar list for yourself, for next month. Naturally, and it goes without saying, remember to have fun with this list to get your life uncluttered! 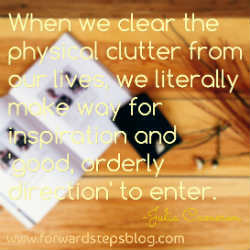 This entry was posted in Self-Improvement and tagged Get Your Life Uncluttered. Bookmark the permalink.